Instant Replay Review upheld 1B Umpire Vic Carapazza's foul ball (no HR) call in the top of the 3rd inning of the Athletics-Twins game. With one out and none on, A's batter Jed Lowrie hit a 3-2 changeup from Twins pitcher Kevin Correia to deep right field and past the foul pole. Upon Instant Replay Review as the result of a request by A's Manager Bob Melvin and initiation by crew chief Bill Miller, Carapazza's ruling that the ball left the playing field in foul territory (to the right of the foul pole) was affirmed, the call was correct. At the time of the review, the A's were leading, 2-1. The A's ultimately won the contest, 8-3. This is Vic Carapazza (19)'s first Instant Replay Review of 2014. Vic Carapazza is now 1/1 (1.000 Affirmation Rate) in Instant Replay Reviews during 2014. Crew Chief Bill Miller's crew is now 1/1 (1.000 Affirmation Rate) in Replay Reviews during 2014. 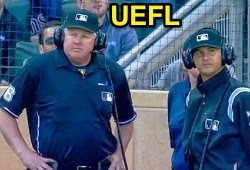 This is the 45th Instant Replay Review of the 2014 MLB Regular Season. Athletics Manager Bob Melvin is now 0/4 (.000 Success) in Instant Replay Challenges/Reviews during 2014. Umpires are now 29/45 (.644 Affirmation Rate) in Instant Replay Reviews during the 2014 MLB season.